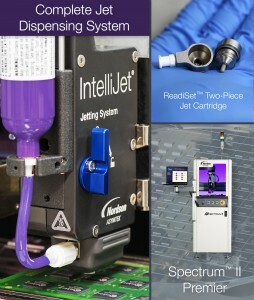 Nordson ASYMTEK, a Nordson company, introduces the Spectrum II Premier with the IntelliJet jetting system for dispensing small dot sizes at high frequencies without compromising the precision, high yield, and long-term reliability needed for advanced packaging applications. The IntelliJet system incorporates ASYMTEK’s patent-pending 2-piece ReadiSet™ jet cartridge for fast and simple cleaning and maintenance. Taking advantage of piezo-driven jet dispensing technology, the system jets a wide range of fluids in dot sizes from one to hundreds of nanoliters. 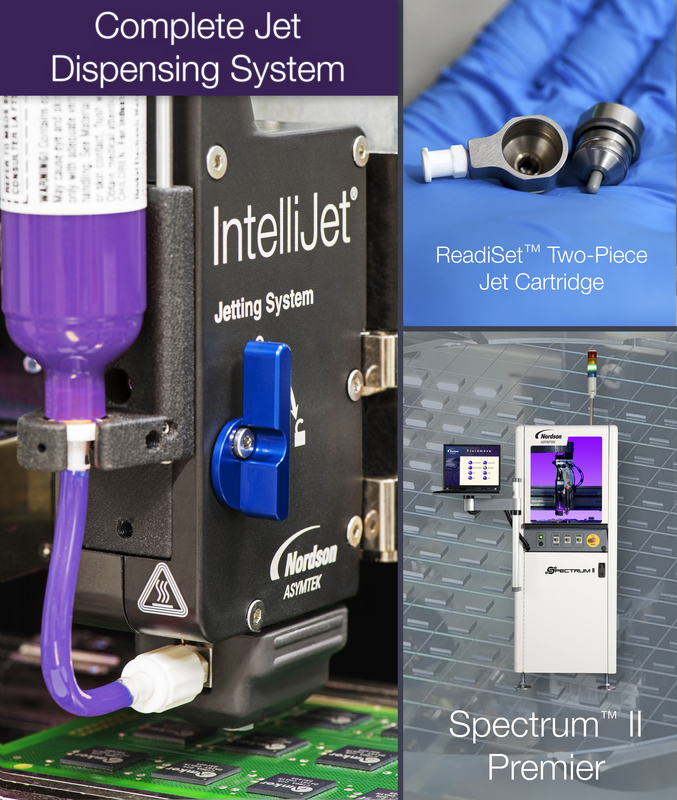 The Spectrum II Premier system’s closed-loop process controls integrate enhanced features for IntelliJet setup, calibration, and control to ensure consistent dispensing performance, reliability, and durability far above other piezo-driven jets on the market today. The Spectrum II Premier system is built on the award-winning Spectrum II fluid dispensing platform and leverages ASYMTEK’s 30+ years of experience as the global leader in designing and manufacturing precision fluid dispensing equipment for high-volume production environments. The IntelliJet system’s self-calibration features and the platform’s patented closed-loop process controls ensure that dispense results remain consistent despite variances in consumable hardware, setup, and wear. Users can reliably transfer their dispense processes across multiple Spectrum II Premier platforms and achieve identical performance in fluid break-off, eliminating satellites and accumulation. The ReadiSet jet cartridge maximizes up-time because only the wetted fluid path parts are changed, allowing the jet actuator to remain on the platform. Individual components of the ReadiSet cartridges are easily exchanged, minimizing cost-of-ownership.